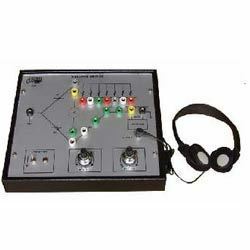 We provide highly efficient Bridge Apparatus for use in various engineering colleges and research institutes. These educational instruments are targeted towards supporting the education of students all across the country. 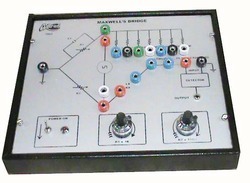 With the aid of latest technology, we have been able to manufacture the optimum quality of Maxwells Bridge Apparatus. 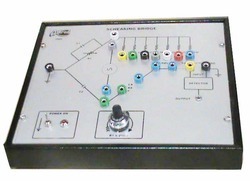 For studying the ac bridges for measurement of inductance, the offered apparatus are used. Being a quality oriented organization, we assure that the quality of the offered maxwell’s bridge apparatus is always maintained at our end. 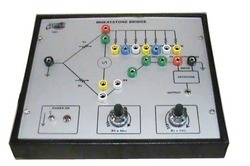 Dedicated trainer board for each bridge. Demonstrates the principle and working of ac bridges for measurement of inductance. Head-phone set for sensitive detection. Built-in variable arms and multiplier. Multi-coloured test points at various stages in the circuit to observe waveforms and voltages. Demonstrates the principle and working of ac bridges for measurement of capacitance. As a praiseworthy name, we manufacture and supply the optimum quality of Wheatstones Bridge Apparatus. Due to its better energy efficiency and compact design, the offered bridge apparatus are highly demanded. Accessible with us in various particulars, as per the needs and requirements of our patrons. 4 Dedicated trainer board for each bridge. 4 Demonstrates the principle and working of AC bridges for measurement of inductance. 4 Supply required 230V, 50 Hz AC. 4 Built - in IC based DC regulated power supply with short circuit protection and LED indication for supply “ON”. 4 Built - in 1KHz oscillator. 4 Built - in imbalance amplifier. 4 Head - phone set for sensitive detection. 4 Built - in variable arms and multiplier. 4 Multi - coloured test points at various stages in the circuit to observe waveforms and voltages. 4 Set of patch cords. 4 Housed in an elegant cabinet with a well spread intelligently designed circuit layout on the front panel. 4 Strongly supported by a comprehensive manual complete with theory and operating details. 4 Demonstrates the principle and working of AC bridges for measurement of capacitance. 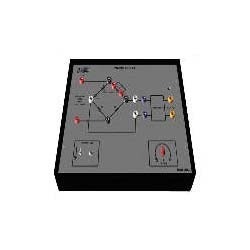 P Dedicated trainer board for each amplifier circuit. P Demonstrates the principle and working of AC bridges for measurement of Inductance in terms of capacitance & Resistance. P Supply required 230V, 50 Hz AC. P Built - in IC based DC regulated power supply with short circuit protection and LED indication for supply “ON”. P Built - in 1KHz oscillator. 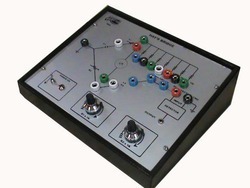 P Built - in imbalance amplifier. P Head - phone set for sensitive detection. P Built - in variable arms and multiplier. P Multi - coloured test points at various stages in the circuit to observe waveforms and voltages. 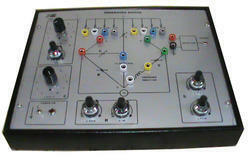 P Housed in an elegant metal cabinet with a well spread intelligently designed circuit layout on the front panel. P Strongly supported by a comprehensive instruction manual complete with theory and operating details. P Built - in DC regulated power supply with short circuit protection and LED indication for supply “ON” to work on 230V AC Mains. We manufacture and supply the superior quality of Weins Bridge Apparatus. Offered by us in various specifications, the offered apparatus are known for enhanced functionality and durable construction. Large production capacity of the wein’s bridge apparatus, has helped in meeting the bulk demands in the most efficient manner. Being a quality focused name, we manufacture and supply the finest quality of Kelvins Bridge Apparatus. 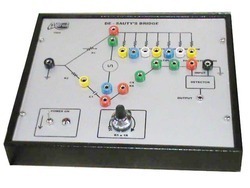 The working of ac bridges for measurement of resistance is studied and demonstrated by using kelvin’s bridge apparatus. We deliver the offered kelvins’ bridge apparatus within the assured time frame at the patrons’ end. Demonstrates the principle and working of ac bridges for measurement of resistance.